the lymphatic system plays a significant role in atherosclerosis. Clearance of oxidized cholesterol from the large and medium-sized arterial wall is dependent upon properly functioning intramural and adventitial lymphatic vessels. This function can be severely impeded by inflammation or augmented to increase lymphatic flow and improve fluidity by lifestyle changes such as diet, exercise, stress modification and toxin avoidance. In order to optimize cardiovascular health, the cycle of oxidation, inflammation and lymphatic dysfunction in the arterial wall must be interrupted by the known and well documented lifestyle modifications. This review cites recent scientific publications that support the importance of the lymphatic system in the reverse cholesterol transport. These works, compilated with those of beneficial integrative modalities, make a strong case for support of this concept. Incorporating the lymphatic system function and those lifestyle changes that affect it, further promotes a unifying concept that includes LDL concentration and density, endothelial dysfunction, intramural inflammation and lymphatic dysfunction, spasm or sclerosis in cardiovascular disease. The lymphatic system is clearly recognized as the immune domain, dealing with infections, tumor cells, waste products and toxins [1-3]. It is also critical in fluid balance between the vascular bed and interstitial tissue- since about 10% of the fluid exchange at the capillary bed remains in the tissue and must be returned to the vascular system by way of the lymphatics . Lastly, and often less acknowledged, is its role in returning large molecules, proteins, lipids and lipoproteins to the vascular system from the tissue space. Among other larger molecules, Apolipoprotein A (APO-A), Apolipoprotein B (APO-B),high density lipoprotein cholesterol (HDL-C) and low density lipoprotein cholesterol (LDL-C) and their metabolites egressing the capillary bed are transported to the venous system by way of lymphatics . The errant lipoproteins that randomly enter the intima of the arterial wall through dysfunctional endothelia also must be metabolized and cleared via lymph channels [6-9]. This presents a problem in the larger and midsized arteries because of the distance to lymphatics, natural barriers and impedance caused by inflammation . Lymphatic function is necessary for the expeditious clearance of cholesterol from the arterial wall . Cholesterol can be found throughout the entire thickness of the arterial wall, (including the adventitia where lymphatics abound) . The lymphatic channels penetrate the large and medium-sized arteries in the middle to outer third of the media . Cholesterol laden foam cells and HDL must penetrate the internal elastic lamina in order to reach these lymph vessels. In the past this was considered unlikely. However, recent research has shown that this indeed occurs [13-22]. Lymphatic endothelial cells express inflammation-producing proteins and peptides, augmenting the inflammatory cascade . These cells are also responsive to inflammation producing molecules . The lymph channels also contain autonomic nerve endings and contractile smooth muscle fibers making them intimately connected to the neuro- endocrine -systems . Since the lymph system warehouses lymphocytes and is the immune cells’ conduit, it exquisitely integrates the endocrine, nervous and immune system for biofeedback, signaling and mind -body interactions . The lymph vessels can dilate or constrict . They have rhythmic pulsation, can go into spasm or become sclerosed . Lymph fluid  also has great rheological variability, as it can be more fluid in the sol phase, or more viscous in the gel phase. Its fluidity may be altered by water content and the concentration of formed elements. Its volume is changed by an increase head of pressure as seen in hypertension or anoxia which causes an alteration in capillary permeability with an increase in the filtrate and proteins into the interstitium . Inadequate lymphatic clearance of lipoproteins from the arterial wall as a possible cause of atherogenesis was first postulated 35 years ago . Although this concept could adequately explain the positive correlation with known risk factors for coronary artery disease and the negative correlation with high density lipoproteins and lifestyle modifications, little research was undertaken in this area [14,28-30]. The confluence of drainage from the arterial wall lymph with that of the capillary interstices affects the data when measuring the lipoprotein content in lymph vessels. The pathways for LDL, HDL, nascent HDL,APO-A APO-B and other lipoprotein’s can be conflated as particles trapped in large and medium sized arterial walls and those transiting from the gut or para-capillary interstitium  are admixed. However, recent investigative work has clearly demonstrated the lymphatic systems involvement in reverse cholesterol transport [17-22]. In order to better understand this process, it is worthwhile to review cardiovascular pathophysiology and the role that inflammation, diet, exercise, stress and environmental toxins play in the genesis of atherosclerosis. LDL is the primary transporter of cholesterol to the tissues at the capillary level. There, it is an integral component for the manufacture of cell membranes, hormones, pro-vitamins, bile salts and other necessary metabolites . Both the LDL and HDl pass across the peripheral microvascular endothelium by passive ultrafiltration . However, in the large and midsized arteries, LDL-cholesterol  (especially the small dense particles) transgresses endothelium which has become dysfunctional or denuded [8,9], thus losing its integrity. This endothelial dysfunction is a consequence of turbulence, hypertension, aging, inflammation and metabolic disorders. The amount of cholesterol deposition in the intima is predicated by the serum level and density of LDL, the extent of endothelial damage, [6-9,34] inflammation, lymphatic clearance and transit time. Upon passing into the intima, the LDL rapidly becomes oxidized  initiating an endothelial inflammatory process that involves selectins, vascular cellular adhesion molecules and other pro-inflammatory components thus attracting monocytes which are transformed into macrophages after migration into the intima. The inflammatory process is further enhanced by their secretion of pro-inflammatory cytokines and chemokines . The inflammatory process can be initiated by other than at oxidized LDL. Radical oxygen species, infection, homocysteine and Apo-B particles are examples of these initiators [36-39]. In an attempt to minimize this inflammation, the macrophages engulf the cholesterol and unless they can transfer the cholesterol to Apo-A HDL or migrate through the arterial wall, create further inflammation and deposition of cholesterol. The efficiency of cholesterol clearance from the sub intimal space is a key factor in the development of atherosclerosis . The foam cells in the inflamed arterial wall manufacturer chemokines, cytokines and enzymes which immobilizes the macrophages and increase fibroblasts and collagen matrix further slowing down the cholesterols progression to the lymphatics. The discoid HDL is not able to transfer the cholesterol from the foam cells due to myeloperoxidase that is expressed by the macrophages . This egress is further delayed by the expression of neuropeptides like netrin-1, Sema 3A, neuropeptide Substance P, and neuropeptide Y [42,43]. These neuropeptides create inflammation and prevent cholesterol transport. Netrin-1 is a neural guidance cue, secreted by the foam cells in the atheroma and is a powerful chemoattractant and smooth muscle cell recruiter and retardant to macrophage exit from the arterial wall to the lymphatics . This suggests then, that foam cells play a critical but reversible role in atherogenesis . Lipid laden macrophages can remove significant cholesterol amounts if unimpeded, but migration is inhibited by reactive oxygen species created by NADPH oxidase in the presence of oxidized LDL [35,44]. This creates a loss of plasticity of the macrophages cellular actin cytoskeleton. However, antioxidants like N-acetylcysteine, resveratrol and other NADPH oxidase inhibitors can restore normal plasticity . Cholesterol clearance is also accomplished by transfer to nascent HDL through the adenosine triphosphate–binding cassette, ABC A1, transporter mechanism . The work of Nordestgaard  shows that the majority of HDL cholesterol that entered the arterial wall, passes through the internal elastic lamina. This route is also supported by studies that show a higher percentage of cholesterol laden HDL in the lymph then in the plasma [13-16]. Increasing inflammation causes dysfunction of HDL, increasing tissue cellularity and viscosity, immobility and death of the foam cells initiating greater inflammation and creation of an atheroma. 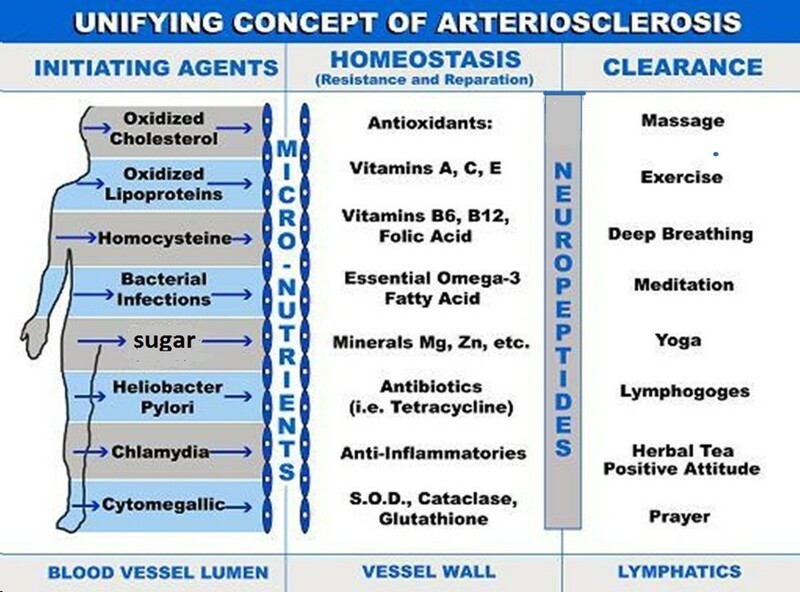 The longer the arterial wall is exposed to these inflammation-inducing molecules, the greater the tissue destruction and progression of atherosclerosis [13-16,39,46,47]. The vicious cycle of oxidation, inflammation and delayed lymphatic clearance creates an intriguing model to explain some of the negative and positive correlations to atherosclerosis. Lymphatic flow is increased with exercise, deep breathing, stress modification and a diet high in vegetables and is decreased with a sedentary lifestyle, a pro-inflammatory diet with reactive oxygen species, and stress . These factors correlate both negatively and positively with the incidence of atherosclerosis [1,48]. There is much evidence for the cardiovascular protective effect of a diet high in fruits and vegetables [49-52]. Plants contain the lymph stimulating polyphenols and flavonoids. Lymphagogic products are essentially compounded flavonoids like Daflon, a combination of two flavonoids – hesperidin and Diosmin. These flavonoids reduce the expression of the ICAM-1, L-Selectin and VCAM-1 besides increasing the intensity and frequency of lymphatic contraction and increasing the total number of lymphatic capillaries. This results in the decrease of adhesion, migration, and activation of leukocytes, leading to lowering of prostaglandin’s PGE2 and PGF2a and the reduction of radical oxygen species [53-58]. Vitamin D down regulates the inflammation of macrophages and monocytes and slows the ingress of monocytes and dendritic cells into the intima [59-60]. Exercise is essential for optimum cardiovascular health. Exercise considerably increases lymphatic circulation, positively affects anti-inflammatory markers and reduces pro-inflammatory ones [61,62]. On its way to the venous system, the majority of lymph flows through the thoracic duct in the chest. Lymph flow through the chest cavity is significantly increase by rapid deep breathing  which creates larger diaphragmatic excursions, increases the negative intrathoracic pressure and stimulates lymphatic flow . Changes of physical activity maximize lipid clearance and circulating dendritic and T cells which have been shown to be increasingly significant in cardiovascular disease [64-67]. Physical and mental stress are significant in the production of inflammation and atherosclerosis [25,68]. Stress increases the epinephrine and cortisol levels and chronic stress can lead to lymphatic sclerosis [68,69]. Lemole G (2014)The role of lymphstasis in atherogenesis. Ann Thoracic Surg 31: 290-294. Zolla V, Nizamuldinova IT, Scharf B, Clement CC, Maejima D, Akl T, et al. (2015) Aging- related anatomical and biochemical changes in lymphatic collect doors impair lymph transport, fluid homeostasis, and pathogen clearance. Aging Cell. Kleinstreuer C, Hyun S, Buchanan JR, et al. (2001) Hemodynamic parameters and early intimal thickening in branching blood vessels. Crit Rev Biomed Eng 29: 1-64. Dabagh M, Jalali P, Tarbell JM (2009) The transport of LDL across the deformable arterial wall: The effect of endothelial cell turnover and intimal deformation under hypertension. Am J Physiol Heart Circ Physiol 297: 983-996. Davies MJ, Woolf N, Rowles PM, et al (1988) Morphology of the endothelium over atherosclerotic plaques in human coronary arteries. Br Heart J 60: 459-464. Adams CWM, Bayliss OB, Davison AN (1964) Auto radiographic evidence for the outward transport of H-cholesterol through rat and rabbit aortic wall. J Pathol Bacteriol 87: 297. Reichl D, Rudra DN, Myant NB, et al. (1982) Further evidence for the role of high density lipoprotein in the removal of tissue cholesterol in vivo. Atherosclerosis 44: 73-84. Rudra DN, Myant NB, Pflug JJ, et al. (1984) The distribution of cholesterol and apoprotein A-I between the lipoproteins in plasma and peripheral lymph from normal human subjects. Atherosclerosis 53: 297-308. Nanjee MN, Cooke CJ, Olszewski WL, Miller NE (2000) Lipid and apolipoprotein concentrations in prenodal leg lymph of fasted humans. Associations with plasma concentrations in normal subjects, lipoprotein lipase deficiency, and LCAT deficiency. J Lipid Res 41: 1317-1327. Randolph G (2008) Emigration of monocyte-derived cells to lymph nodes during resolution of inflammation and its failure in atherosclerosis. Curr Opin Lipidol 19: 462-468. Lim HY, Thiam CH, Yeo KP, et al. (2013) Lymphatic vessels are essential for the removal of cholesterol from peripheral tissues by SR-BI-mediated transport of HDL. Cell Metab 17: 671-684. Vuorio, T, Nurmi H, Moulton K, et al. (2014) Lymphatic vessel insufficiency in hypercholesterolemic mice alters lipoprotein levels and promotes atherogenesis. Arterioscler Thromb Vasc Biol 34: 1162-1170. Kutkut, I, Meens MJ, McKee TA, et al. (2015) Lymphatic vessel insufficiency in hypercholesterolemic mice alters lipoprotein levels and promotes atherogenesis. Eur J Clin Invest 45: 100-108. Schmidt D, Reber SO, Botteron C, et al. (2010) Chronic psychosocial stress promotes systemic immune activation and the development of inflammatory Th cell responses. Brain Behav Immun 24: 1097-1104. Chakraborty S, Davis MJ, Muthuchamy M (2015) Emerging trends in the pathophysiology of lymphatic contractile function. Semin Cell Dev Bio. Nordestgaard BG, Hjelms E, Stender S, et al. (1990) Different efflux pathways for high and low density lipoproteins from porcine aortic intima. Arteriosclerosis 10: 477-486. Nádasy GL, Solti F, Monos E, et al. (1989) Effect of two-week lymphatic occlusion on the mechanical properties of dog femoral arteries. Atherosclerosis 78: 251-260. Gavrish AS (1990) The morphogenesis of chronic failure of the lymph outflow from the heart in this lipoproteinemia and recurrent myocardial ischemia. Arkh Patol 52: 11-16. Bellingan GJ, Caldwell H, Howie SE, et al. (1996) In vivo fate of the inflammatory macrophage during the resolution of inflammation: Inflammatory macrophages do not die locally, but emigrate to the draining lymph nodes. J Immunol 157: 2577-2585. Michel CC, Nanjee MN, Olszewski WL, Miller and NE (2010)P LDL and HDL transfer rates across peripheral microvascular endothelium agree with those predicted for passive ultrafiltration in humans. J Lipid Res. Lamarche B, St-Pierre AC, Ruel IL, et al. (2001) A prospective, population-based study of low density lipoprotein particle size as a risk factor for ischemic heart disease in men. Can J Cardiol 17: 859-865. Park YM, Febbraio M, Silverstein RL (2009) CD36 modulates migration of mouse and human macrophages in response to oxidized LDL and may contribute to macrophage trapping in the arterial intima. J Clin Invest 119: 136-145. Pietzsch J, Lattke P, Julius U (2000) Oxidation of apolipoprotein B-100 in circulating LDL is related to LDL residence time. In vivo insights from stable-isotope studies. Arterioscler Thromb Vasc Biol. 20: E63-E67. Oyinloye BE, Adenowo AF, Kappo AP (2015) Reactive oxygen species, apoptosis, antimicrobial peptides and human inflammatory diseases. Pharmaceuticals 8: 151-175. Rohatgi A, Khera A, Berry JD, et al. (2014) Cholesterol efflux capacity and incident cardiovascular events. N Engl J Med 371: 2383-2393. Shao B, Tang C, Sinha A, et al. (2014) Humans with atherosclerosis have impaired ABCA1 cholesterol efflux and enhanced high-density lipoprotein oxidation by myeloperoxidase. Circ Res 114: 1733-1742. Lagraauw HM, Westra MM, Bot M, et al. (2014) Vascular neuropeptide Y contributes to atherosclerotic plaque progression and perivascular mast cell activation. Atherosclerosis 235: 196-203. Wanschel A, Seibert T, Hewing B, et al. (2013) Neuroimmune guidance cue Semaphorin 3E is expressed in atherosclerotic plaques and regulates macrophage retention. Arterioscler Thromb Vasc. Biol 33: 886-893. Van Gils JM, Derby MC, Fernandes LR, et al. (2012) The neuroimmune guidance cue netrin-1 promotes atherosclerosis by inhibiting the emigration of macrophages from plaques. Nat Immunol 13: 136-143. Llodrá J, Angeli V, Liu J, et al. (2004) Emigration of monocyte-derived cells from atherosclerotic lesions characterizes regressive, but not progressive, plaques. Proc Natl Acad Sci USA 101: 11779-11784. Meyer G, Merval R, Tedgui A (1996) Effects of pressure-induced stretch and convection on low-density lipoprotein and albumin uptake in the rabbit aortic wall. Circ Res 79: 532-540. Fung T, Hu F (2003) Plant-based diets: What should be on the plate? Am J Clin Nutr 78: 357-358. Ginter E, Simko V (2015) Recent data on Mediterranean diet, cardiovascular disease, cancer, diabetes and life expectancy. Bratisl Lek Listy 116: 346-348. Vogel G, Ströcker H (1966) The effect of drugs–especially flavonoids and aescin–on the lymph flow and the permeability of the intact plasma-lymph barrier of rats for fluid and defined macromolecules. Arzneimittelforschung 16: 1630-1634. Shaikemeleva US (1983) Effect of rutin on the cholesterol content of the lymph, blood and tissues of the dog] Biull. Eksp Biol Med 95: 35-37. Takeda M, Yamashita T, Sasaki N, et al. (2010) Oral administration of an active form of vitamin D3 (calcitriol) decreases atherosclerosis in mice by inducing regulatory T cells and immature dendritic cells with tolerogenic functions. Arterioscler. Thromb Vasc Biol 30: 2495-2503. Riek AE, Oh J, Sprague JE, et al. (2012) Vitamin D suppression of endoplasmic reticulum stress promotes an antiatherogenic monocyte/macrophage phenotype in type 2 diabetic patients. J Biol Chem 287: 38482-38494. Geffken DF, Cushman M, Burke GL, et al. (2001) Association between physical activity and markers of inflammation in a healthy elderly population. Am J Epidemiol 153: 242-250. Schad H, Brechtelsbauer T (1977) Thoracic duct lymph in conscious dogs at rest and during exercise. Pfluger Arch 367: 235 – 240. Wilhelm AJ, Zabalawi M, Grayson JM, et al. (2009) Apolipoprotein A-I and its role in lymphocyte cholesterol homeostasis and autoimmunity. Arterioscler Thromb Vasc Biol 29: 843-849. Liao S, Cheng G, Conner DA, et al. (2011) Impaired lymphatic contraction associated with immunosuppression. Proc Natl Acad Sci USA 108: 18784-18789. Bobryshev YV, Lord RS (1998) Mapping of vascular dendritic cells in atherosclerotic arteries suggests their involvement in local immune-inflammatory reactions. Cardiovasc Res 37: 799-810. Reiss AB, Wan DW, Anwar K, et al. (2009) Enhanced CD36 scavenger receptor expression in THP-1 human monocytes in the presence of lupus plasma: linking autoimmunity and atherosclerosis. Exp Biol Med 234: 354-360. Marcondes MC, Zhukov V, Bradlow H, et al. (2011) Effects of chronic mental stress and atherogenic diet on the immune inflammatory environment in mouse aorta. Brain Behav Immun 25: 1649-1657. Selye H (1975) The Stress of Life. Revised Edition, McGraw-Hill, New York 22-23. Ramanathan G, Yin F, Speck M, Tseng CH, Brook JR, Silverman F,et al. (2016) Effects of urban fine particulate matter and ozone on HDL functionality. Part Fibre Toxicol 13: 26. Ostro B,Malig B, Hasheminassab S, Berger K, Chang E, Sioutas C (2016) Associations of source specific fine particulate matter with emergency department visits in California. Am J epidemiol PII: KWV 343. Lemole GM (2000) Unifying concept of arteriosclerosis (table 4.14) an integrative approach to cardiac care. Medtronic 46. ©2016 Lemole GM. This is an open-access article distributed under the terms of the Creative Commons Attribution License, which permits unrestricted use, distribution, and reproduction in any medium, provided the original author and source are credited.